I’ve just totted up my invested portfolio’s returns in September. The bad news: I’m down 1.1%. The good news: the markets I’m in fell 1.6% on a weighted average basis. 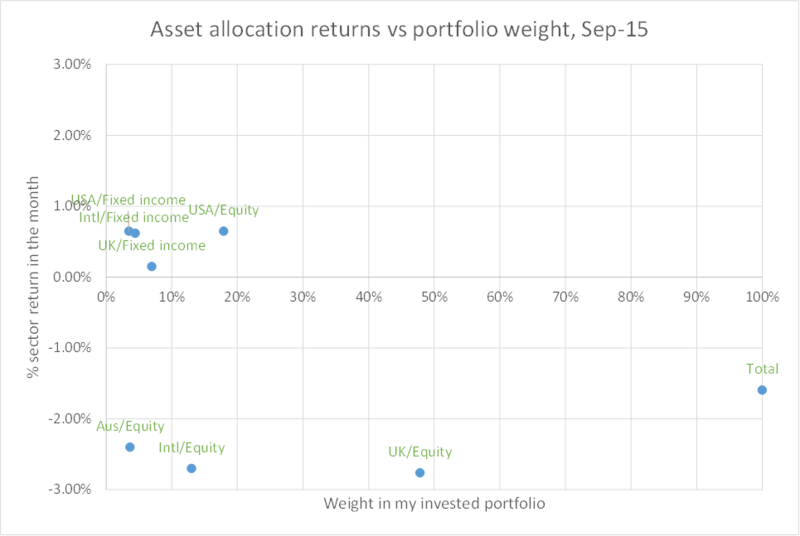 I’ve plotted below the returns of each of my major asset types (geography vs equity/fixed income) for September. Equities fell by 2-3% in UK/International/Australia – though not in the USA. Half my portfolio is UK Equities, where the market fell by almost 3% this month. Fixed Income assets were generally up – a classic case of uncorrelated behaviour between equities and bonds – which helped my overall portfolio return significantly. If I’d had purely passive exposure I’d have had the weighted average return of about -1.6% for the month. In this context my actual return of -1.1% is fine by me. I’m not sure that my outperformance is luck, my genius, or my market benchmarking not fully allowing for dividends – of which my portfolio received a bunch in September as it is the quarterly payout month for both iShares and Vanguard. As ever, I’m buying – trying where possible to rebalance to USA Equity which remains below its target allocation. Is this format helpful/clear? Any suggestions for how I could improve it? Please leave me comments below. @TV – I think the ‘normal’ range of £:$ is between £1:$1.5 and £1:$1.6. We’re in that range right now. And the US stocks I’m buying have large (typically 50%+) non-USA sales, which diversifies/hedges the position too. Which means, no, the exchange rate doesn’t bother me right now. Should it? Most of my USA exposure is through two brokers where I lose much less than 4 cents (one of whom, amazingly, charged commissions of under $5 for the last two trades). I do have one broker where you are right but I take the view that as I plan never to sell then the 4 cents is amortisable over several years. What slows me down further is that I don’t put USA investments into my ISAs or SIPPs. It’s great you’ve got a broker where you can get a cheap deal. Who do you use? I used to use TradeKing, but they now don’t accept foreign accounts for some inexplicable reason. They were dirt cheap. The main one is Interactive Brokers. You can deposit funds in GBP, EUR, USD, CHF etc. And you can trade foreign exchange at market rates (via a very confusing interface, I concede).